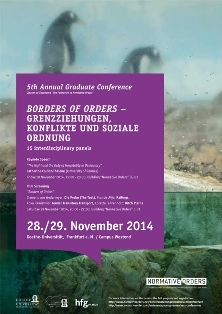 External activity | Jovanka Popova's presentation at the conference „Borders of Orders - Grenzziehungen, Konflikte und soziale Ordnung“ | Goethe University Frankfurt | 28 – 29 November, 2014. Processes of production, reproduction and the questioning of social orders are often connected to conflicts about and the contestation of borders. Borders are set by demarcating an outside or other from an inside, where order is established. Various orders, on the other hand, are challenged in conflicts, by shifting, perforating or deconstructing their borders, which may separate friend from enemy, law and crime, public and individual interests. Recent developments and shifts may be seen as an inspiration to explore the interplay between borders and orders theoretically and empirically at this conference. In order to shed light on this connection on different levels and in its different manifestations, this conference draws on a very broad understanding of borders as well as social order. The topos of the border is discussed with regard to its implications for the production of and conflicts about social orders from an interdisciplinary perspective.